When yours is a love meant to last forever, why not marry hearts and minds with a ceremony that stands the test of time? Here, the sprawling embrace of a 350-year old stand of live oak trees symbolize the maturity and endurance symbolized in your vows. If simple elegance, grace and ease are high on your list of requirements, we’re here to serve. First, you’ll find Newell Lodge offers the beauty, privacy and exclusivity you’ll find at the region’s high-end resorts. However, thanks to our off-the-beaten-track appeal, we are able to offer high quality options to suit a range of budgets, specifically tailored to the bride and groom’s personal situation. Yes, we offer all-inclusive rustic weddings at Newell Lodge, each designed around the bride and groom’s heartfelt desires for the wedding ceremony and meaningful exchange of vows. Because it’s important to us that each wedding is unique and special, our offer to host your wedding at Newell Lodge will include individualized plans for family lodging, ceremony staging, themed decor and personalization, along with hand-picked reception settings and menus designed to exceed expectations. What does “individualized” mean? Here’s one example. 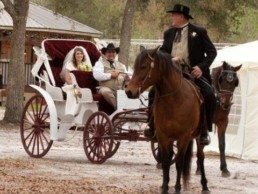 At Newell, brides can choose to arrive by horse drawn carriage, a modern day Cinderella in a vision of white. Or, wedding guests can be delivered to your private arbor by wagon, just as they would have arrived a century before. Each couple decides what details matter most, and we place attention on those things when creating your perfect day. 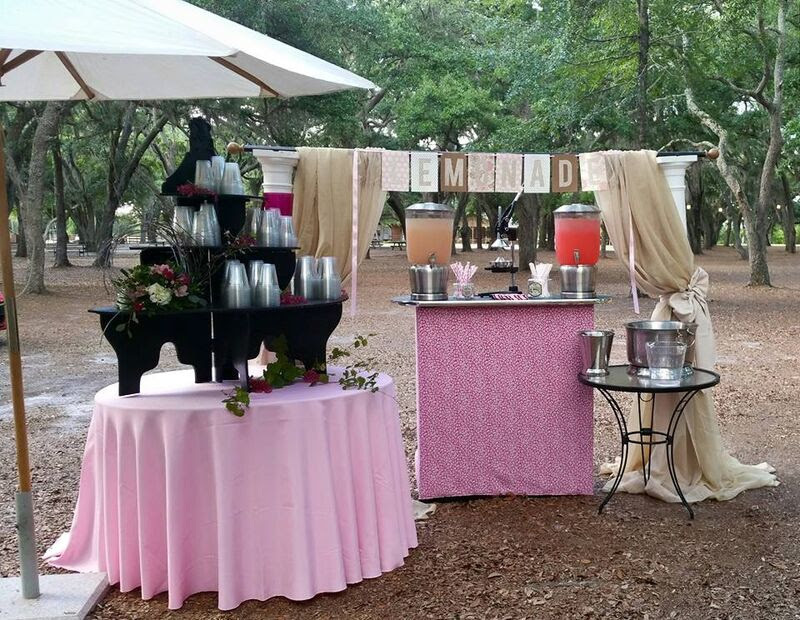 Due to the care and attention we give each wedding, and due to the value we provide, we suggest starting with a conversation with our in-house Southern hospitality consultant and event coordinator. The first step to working together is to determine whether we can truly fulfill your needs. We want each bride and groom to feel their wedding is truly their own, so we ask a lot of questions and listen carefully so we can suggest the next steps for you. incredible value and a quality experience for each guest. At Newell Lodge, we bring the wedding party to you. 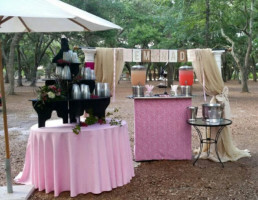 Whether planning a “Spa Night” for your bridesmaids at the lodge or a south Georgia style bonfire and “Bachelor Party” for the groom, we help you choose the perfect hospitality options for the days and nights leading up to your big day. Plan to party at one of the area’s nearby resorts? No problem. We can arrange transportation. Our Southern hospitality consultant can also help you choose and plan Bridesmaid and Groomsman gifts for each person who makes your wedding special, as well as arrange tokens of affection for the Mothers of the Bride and Groom, or other appropriate gestures of gratitude. Children in the wedding party will receive a special Newell Lodge gift of a tiny suitcase with a cuddly stuffed bear, a “passport,” and stickers for each stop on their journey. If you choose, special additions can be made prior to the child’s receipt of the gift. A sparkling bracelet makes a great necklace for a sweet snuggly friend, for example, or a monetary gift can be turned into origami art and tucked into the case. The natural beauty of Newell Lodge, laden with Spanish moss and natural flora and fauna, offers a stunning, backdrop for photographs. At this time, only those whose weddings are hosted at Newell Lodge are allowed to take advantage of this exquisite setting. Photographers can arrive two hours prior to the ceremony to set up and take photos of the wedding party. We offer exceptional privacy for your ceremony, as well as private, single family style lodging. 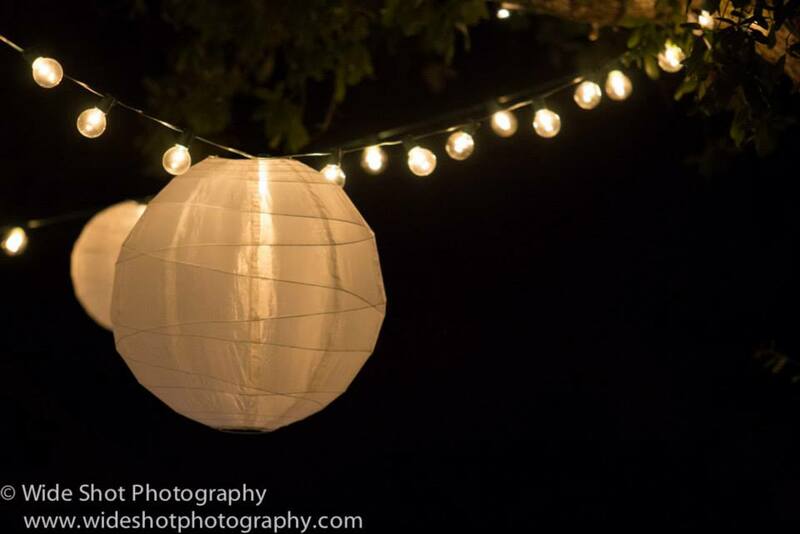 However, yours may not be the only wedding or event held at the lodge during the time of your visit. If you would prefer to have the lodge and grounds reserved for your exclusive use, and that of designated family and friends, those arrangements can be made on a per-diem basis. We’re also happy to extend your visit to include the honeymoon! Or feel free to suggest that your family and friends stay a couple of days to recuperate from the festivities and enjoy the beauty of the Okefenokee and coastal regions. We’ll make sure they feel right at home.